Just days after my birth, the note below was given to me by a physicist, along with a Lichtenberg Figure he made. The parallels between my last name and the nature of my work of helping individuals find their path (or individualize) in order to make their unique contribution to society made Lichtenberg Consulting a fitting name for my company. This is a ‘Lichtenberg Figure,’ which is a plexiglas [lucite] block which is bombarded with a beam of electrons with two million volts of energy. The electrons migrate around the plastic and stay, since the plastic is an insulator. Then a sharp metal point is touched sharply to the plastic block. The other end of the metal point is grounded, and the plastic “sparks” to the point; the electrons rush to the ground. The result is the pattern of tracks you see. The electrons etch the plastic on their way to the ground, and we have a miniature lighting preserved for all to see. No two Lichtenberg Figures are alike. This one is uniquely yours. There is not another one like it in the whole world. Keep it always as a reminder of the affection that we hold for your mother and father, and the wishes for your future that we hold. Remember, there is not another person like you either. 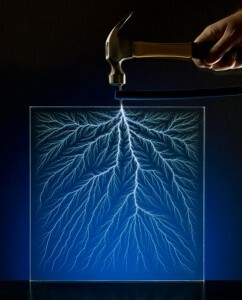 This image is a Lichtenberg Figure, a pattern found in nature from a branching electric discharge. Like a bolt of lightning, the trajectory of highly charged electrons leaves a momentary pattern in the air. 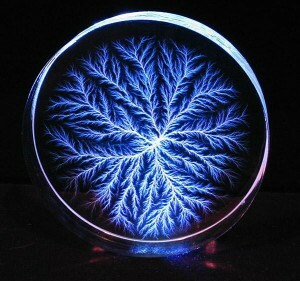 However, in the case of a Lichtenberg Figure, the path of the electrons can be captured permanently in a block of plastic, leaving a unique and everlasting imprint. There are no two Lichtenberg Figures in the world that are alike. As individuals or organizations, we can bring our uniqueness to light. Just like the electrons in a Lichtenberg Figure, we can leave our unique imprint on those around us and the world.